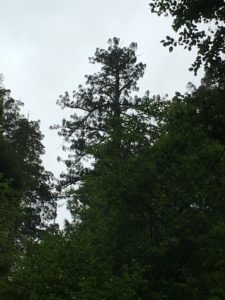 Tall redwood trees tend to grow in groups. 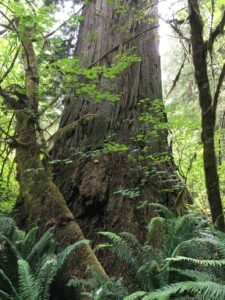 There are specific areas with the best soil, sufficient moisture, protection from wind, and the right mix of sun and fog to promote tall tree growth. 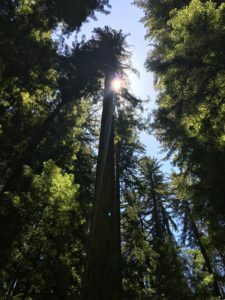 I recently spent a few days in the redwood parks hiking to tall trees along or near trails but still a little bit away from areas where most visitors hike. These areas with tall trees are nature’s cathedrals, with the trunks serving as pillars and the crowns serving as rounded ceilings hundreds of feet off the forest floor. 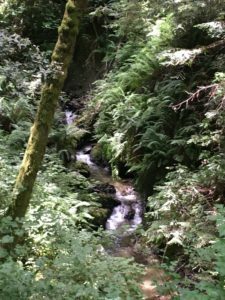 Day one hiking was in the Bull Creek Flats area in Humboldt. 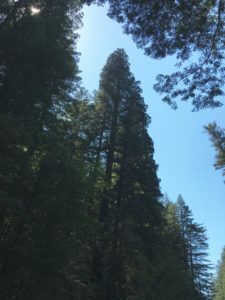 I wanted to get some pictures from the “101 Big Cut” near Founders Grove. On the way to that location there is a spectacular new tree fall at the Dyerville Giant location. 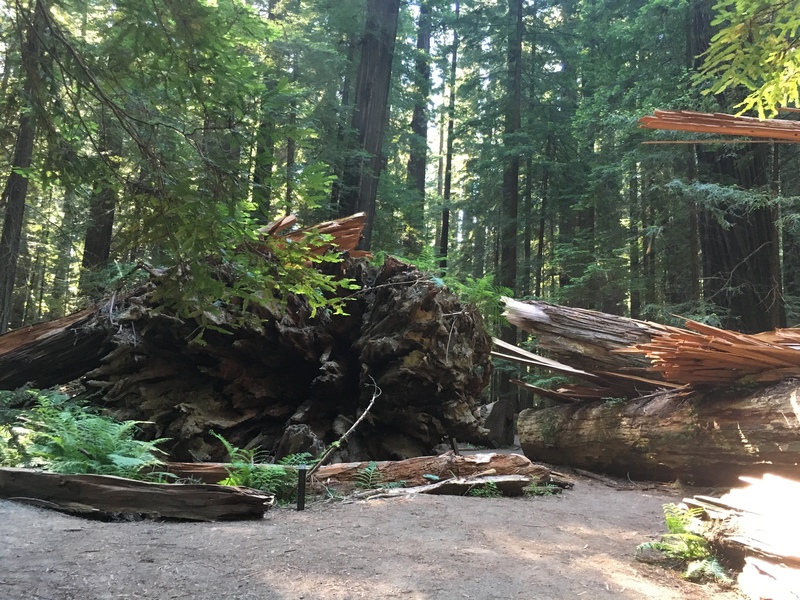 The Dyerville Giant was a tall redwood that fell in 1991 and its big log remains in Founders Grove. Sometime in the early Spring an adjacent redwood fell across that big log and split in several sections. Then on to the Big Cut Trail. 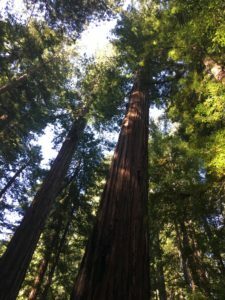 It is a moderately difficult twisting hike up to the top but the reward is a really nice view of the Bull Creek redwoods as well as some interesting civil engineering where the Avenue of the Giants crosses over US 101. 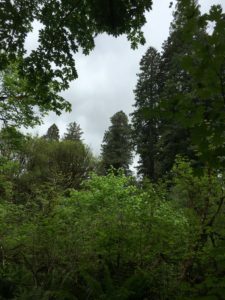 I spent some time in the Harper Flats area near Giant tree. This area is thick with very tall even aged redwoods. It is indeed a tall trees cathedral. 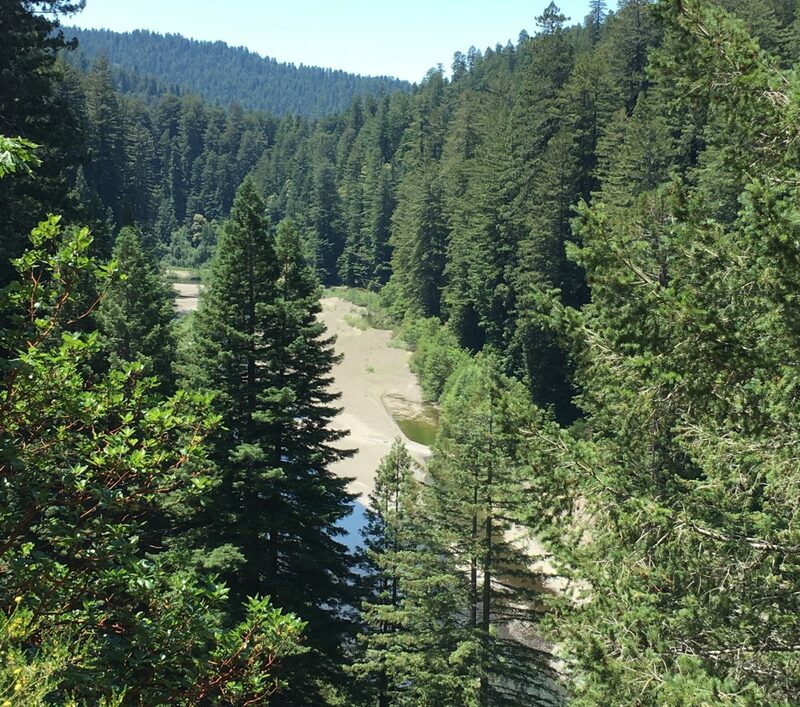 Another nice area visited was along Bull Creek a couple miles upstream from the Eel River South Fork. 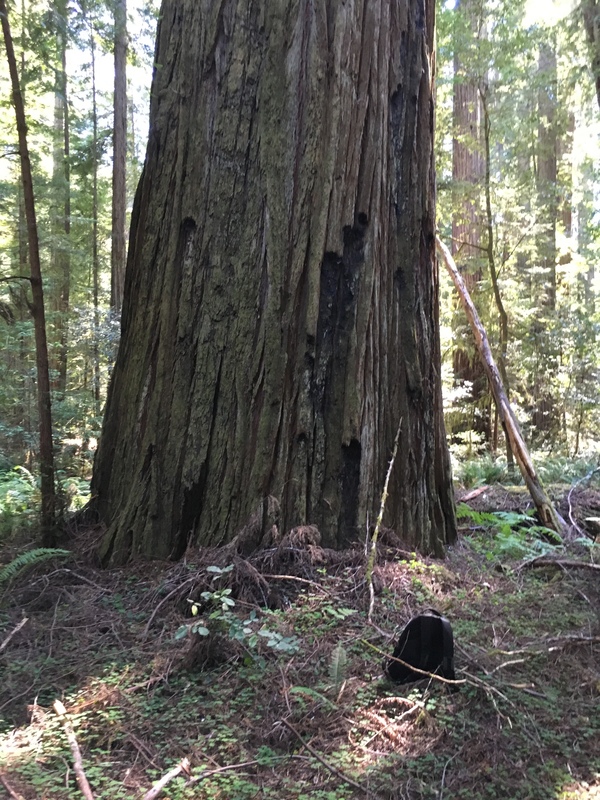 I located a beautiful very tall round domed redwood right along Bull Creek. 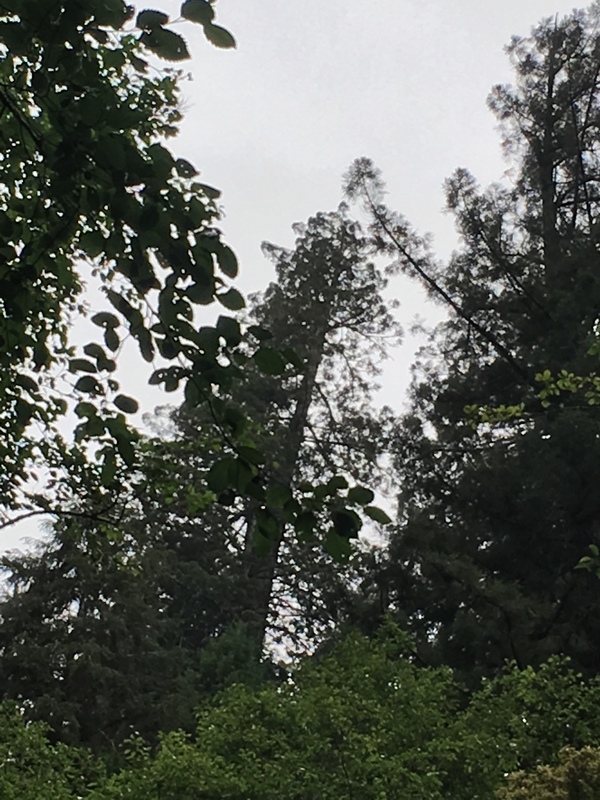 Across the creek from this tree there are two tree trunks rubbing against each other in the wind, this makes a loud screeching sound which kind of sounds like whales singing. 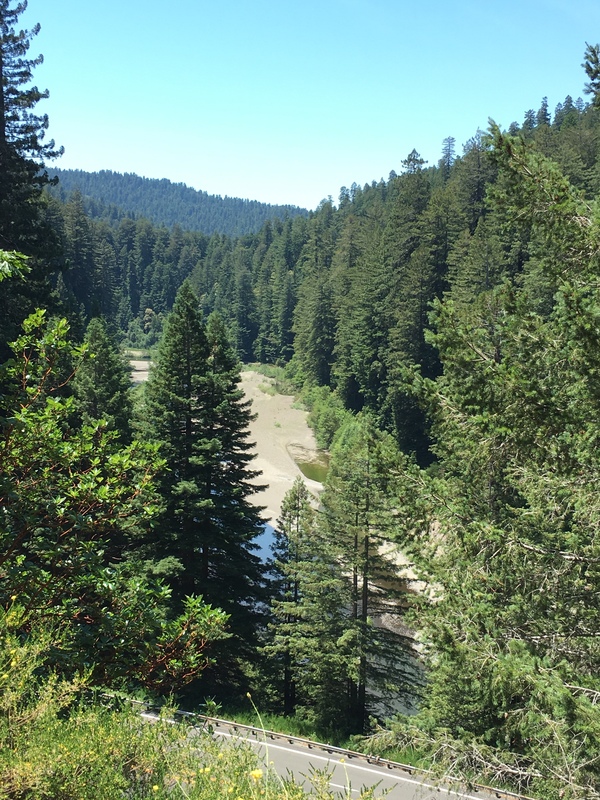 Then in the flats above Bull Creek in this area is a scenic somewhat open forest area with big and tall redwoods. 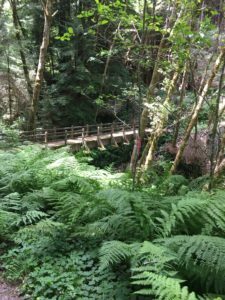 On another day I hiked the Tall Trees Grove trail, crossed Redwood Creek on a seasonal footbridge which had just been put in that day, then hiked Redwood Creek trail north to Forty Four creek. I had hoped to get a good view of the remnant redwood grove along Forty Four creek but did not have clear views of the crowns from the trail. However the bridge and Forty Four creek are both scenic. Be very careful on the bridge as some sections of the side rails are missing. 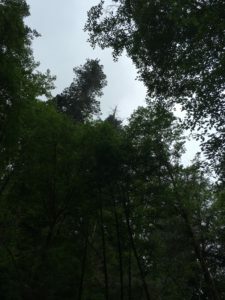 On the way back up and out I stopped at the Redwood Creek overlook and watched the evening fog roll up Redwood Creek valley from the Pacific Oean. It comes in at a pretty quick pace, maybe ten miles per hour on this day. 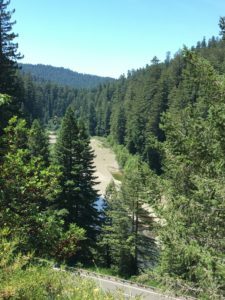 The northern portions of Redwood Creek trail provide nice views of the redwoods along Redwood Creek in several areas, particularly where the trail crosses Redwood Creek just a little north of McArthur Creek. Just north of the Elam Creek Bridge there is a side trail that goes up to the Elam Horse Camp and then intersects with one of the horse trails. 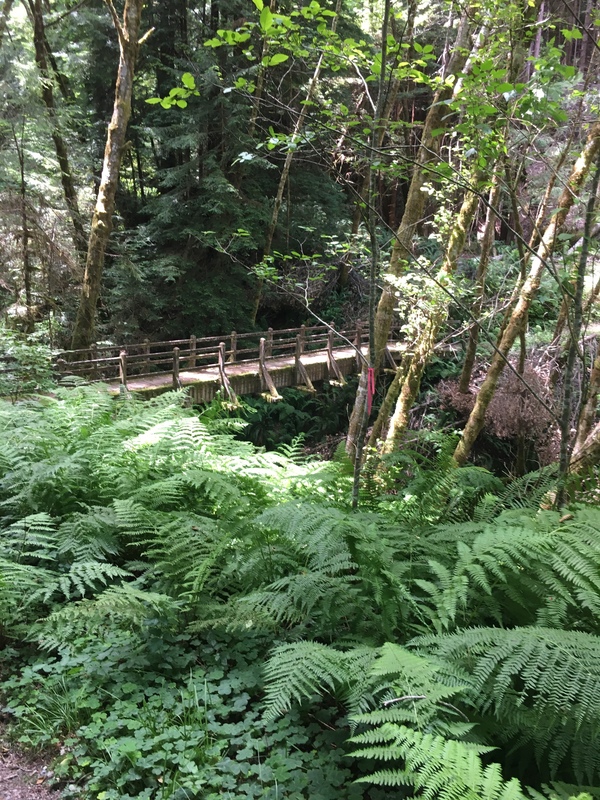 This horse trail follows Elam Creek upstream for about half a mile, then there is a single file bridge where the riders and horses cross Elam Creek. 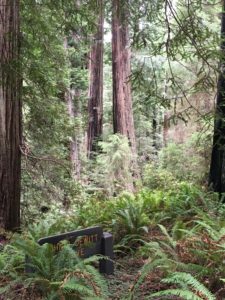 This bridge affords a spectacular view of very tall redwood trees that surround Elam Creek at this point. It is a real back country redwood tree cathedral. 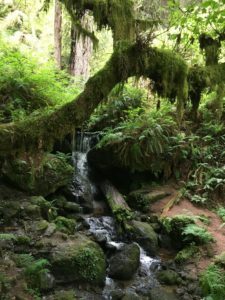 The Trillium Falls trail forms a nice loop through old growth redwoods. The first part of the trail up to Trillium Falls is pretty busy but after that point the trail is less busy. This is probably due to the steep climb to the upland redwoods and the overall length of the loop (about 3 miles). Trillium Falls itself is very scenic. 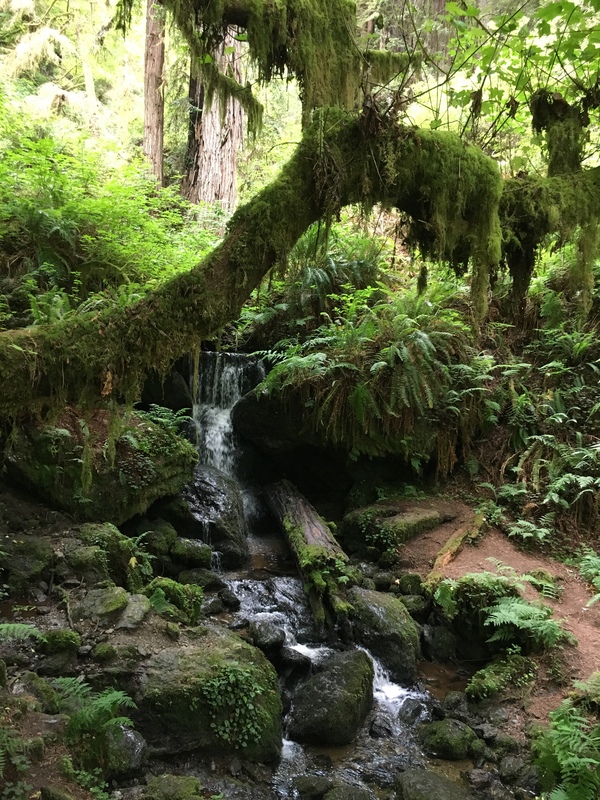 There are also very nice redwoods around these falls. 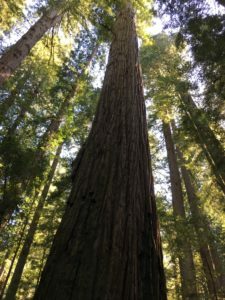 Then past the falls there are some areas with really big and ancient redwoods. There are big redwoods on the climb up Flint Ridge from the Klamath River. On this day I wasn’t able to get to this area due to trail conditions. But reading about the 1964 flood and viewing what remains of the original Klamath River coastal highway bridge was very interesting. 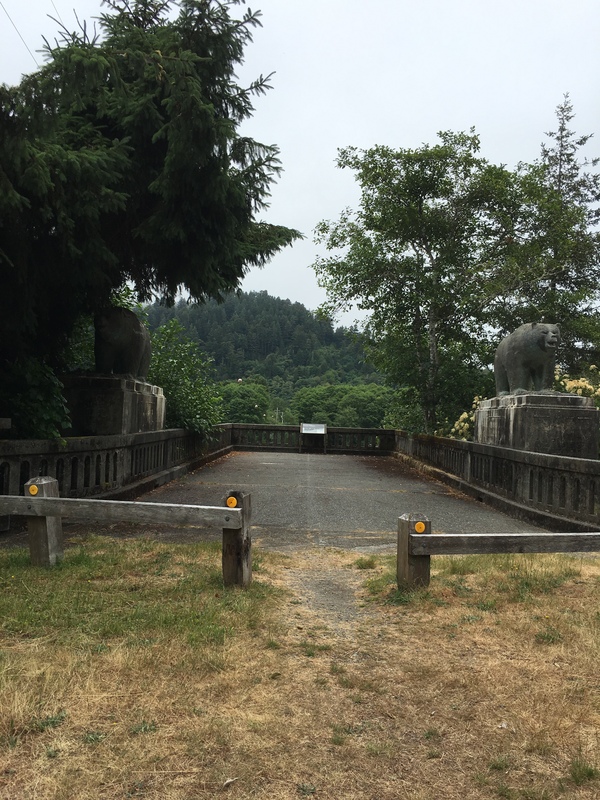 This old bridge has bear statues too, just like the new one. 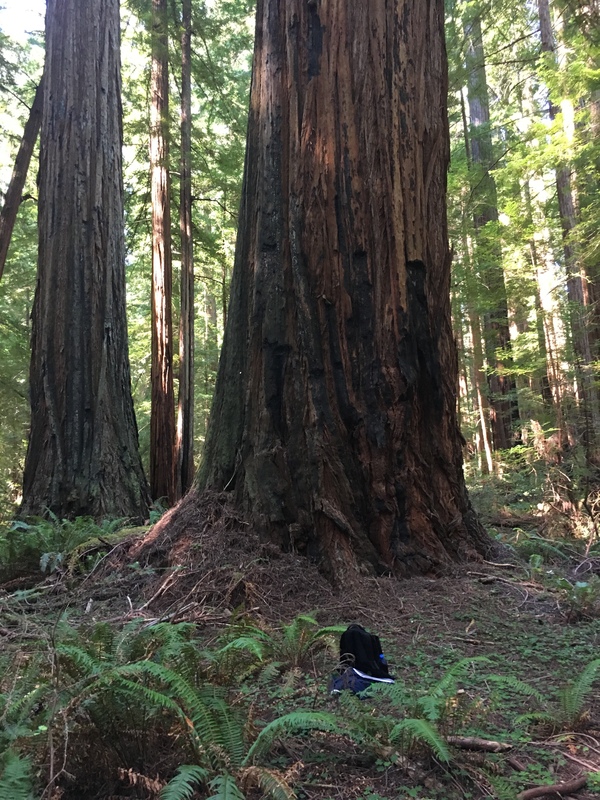 One up side from missing Flint Ridge was it provided some time to get up to Jedediah Smith Redwoods State Park. 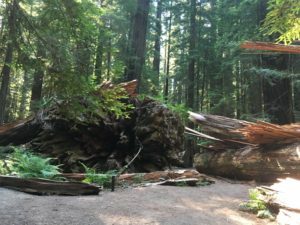 Road repairs had just been completed and the park was accessible from the south all the way up to Stout Grove. 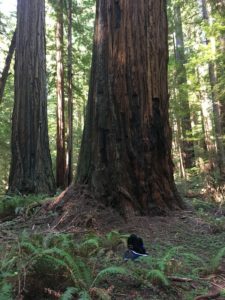 I did some hiking in the big trees area and enjoyed trail side views of some big redwoods. On another day I met my friends Jerry and Teri Beranek for a hike through Montgomery Woods. The many tall redwoods in the flats above the earthen dam and below the surrounding steep hillsides form a continuous redwood cathedral. I get a lot of insights and plant identifications when hiking with Jerry and Teri. Jerry has a couple new books, one on Humboldt and one on Prairie Creek. They are very good, providing interesting background and perspective and many great photos and maps. 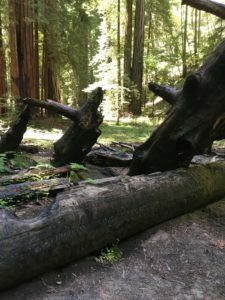 Look for them in the gift shops along the Avenue of the Giants and the Humboldt Visitors Center. Really nice, scenic pics!! Will have to check out Baronek’s books next time am in the area. Thanks for sharing — redwoods are beautiful!